At long last, legendary American death metal cult EMBALMER returns with their long-awaited second album, Emanations From the Crypt. The long-running band’s first album for longtime fans HELLS HEADBANGERS, Emanations From the Crypt is both a new start for EMBALMER and a return to its classic, core values. In 1995, the band released the classic There Was Blood Everywhere EP (of which HELLS HEADBANGERS reissued in 2014, and which sold out quickly) on then-death metal powerhouse Relapse Records, forever etching EMBALMER’s name into death metal legendry. Lineup shuffles ensued in the following years, culminating in the band’s debut album, 2006’s 13 Faces of Death, which is widely regarded (even by the band) as a misstep. 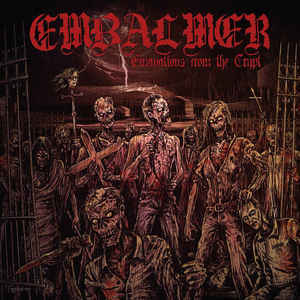 Now armed with a vital ‘n’ vile lineup, EMBALMER return to their dark ‘n’ disgusting roots with Emanations From the Crypt. Across a dozen quick-hitting yet complete tracks, you will find all the trademark EMBALMER elements which obsessed fans back in the ’90s: insane and completely pure blastbeats, sewer-sick riffing, wretched gurgles, and tortured shrieks atop some of the catchiest (but NOT cheesy) songwriting you’ll find on a modern DEATH METAL record. The production is anything but “modern” in the pejorative sense: there are no triggers used on the drums, no beat- or riff-replacement anywhere, and just absolute crushing SICKNESS flowing forth from both guitar and bass, all without losing an ounce of clarity. It’s a classic death metal record from a classic death metal band in an era that’s far from “classic” and full of pretenders. EMBALMER are the real deal once again.